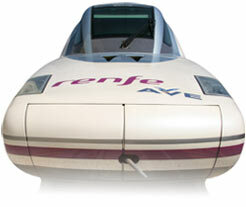 The Talgo 350 is capable of speeds up to ~220 mph (350 kmh). The Talgo 350 trainset includes the Talgo 350 Traction Unit (State of the art AC propulsion with water cooled IGBT technology) and the Series VII Passenger coaches. The Talgo 350 is fitted with latest technology systems for a ‘push-pull’ configuration, four safety systems with tilting suspension and with axles and tractor bogies with Talgo RD gauge changing system. The service capacity is dependant upon the number and type of passenger coaches used within the trainset. A standard consist includes two Talgo 350 Traction Units and up to 12 passenger cars. The quantity and specific type of cars are dependant upon customer service capacity needs. 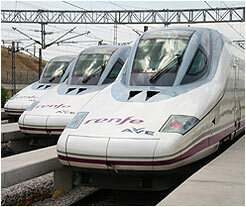 As of the first quarter of 2009, there are 16 Talgo 350 Trainsets (224 cars (including the Power Heads)). An additional 30 trainsets are currently being built and will be running in service soon. 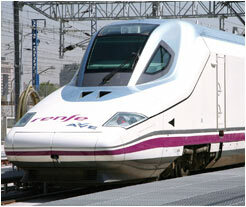 The Talgo 350 trains are currently used in Europe.